A magnitude 5.8 earthquake in 2011 in Mineral, Virginia, was felt up to 600 miles from the epicenter. Tens of millions of people in the eastern United States and southeastern Canada felt this earthquake. For comparison, a magnitude 6.0 earthquake in 2014 in Napa, California, was felt only as far as 250 miles from the epicenter. Despite the Napa earthquake releasing about twice as much energy as the Virginia earthquake and causing much more damage near the epicenter, it wasn’t felt nearly as far away. As another example, the magnitude 4.1 earthquake that occurred in December 2017 near Dover, Delaware, was felt approximately 200 miles from the epicenter. 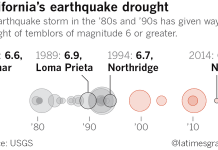 The region that felt this earthquake is about the same size as that of the much larger California event, which released about 700 times more energy. 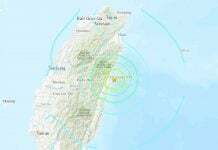 Furthermore, smaller structures such as houses could experience stronger and more damaging shaking in the East. Earthquakes in the East tend to cause higher-frequency shaking—faster back and forth motion—compared to similar events in the West. Shorter structures are more susceptible to damage during fast shaking, whereas taller structures are more susceptible during slow shaking. An example of the earthquake hazard in the eastern U.S. is provided by the surprising level of high-intensity ground shaking that occurred in Washington, DC, during the 2011 Virginia earthquake. 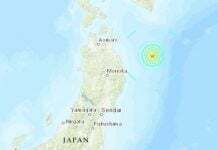 This shaking caused well-publicized damage to some historic buildings, even though the earthquake was moderate in size and its epicenter was 80 miles from the city. 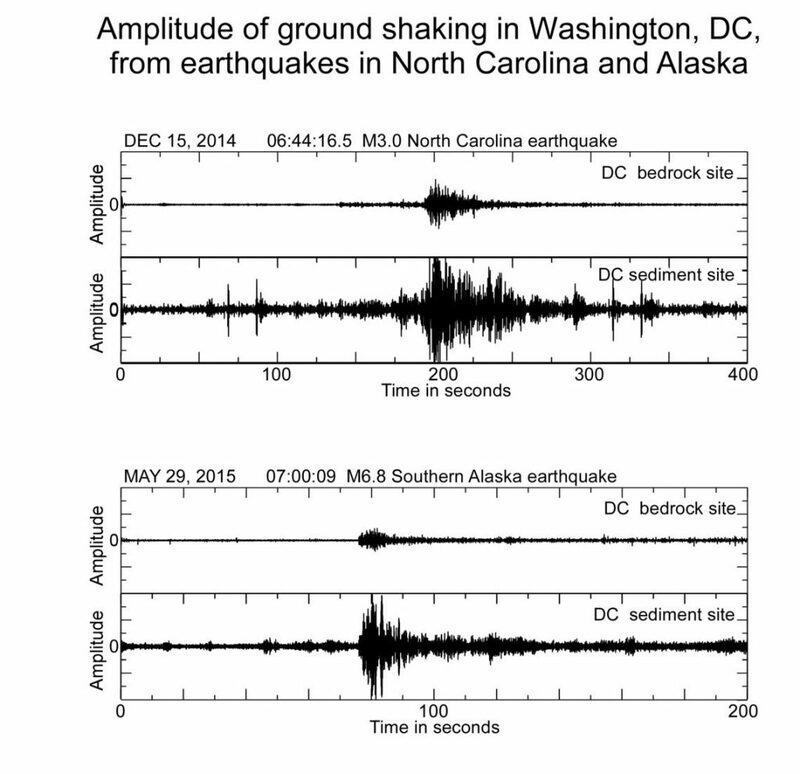 To learn more, USGS scientists deployed 27 temporary seismometers throughout DC to study variations in the strength of earthquake ground shaking. The instruments recorded ground motions from 30 earthquakes around the world during the 10 months they were in place. Scientists confirmed that shaking is amplified in the parts of DC underlain by a thin layer of sediments compared to areas built on more solid, harder bedrock. This is because the energy in the seismic waves can move the lighter, weaker sediments more easily than the harder bedrock, and that energy gets “trapped” and echoes multiple times within the sediments. While this amplification effect has been well documented in some western cities, including Seattle, Los Angeles and San Francisco, this is the first study that directly measures the effect in the nation’s capital. It was previously suspected to occur in Washington, DC, and had been found in other cities such as Boston. 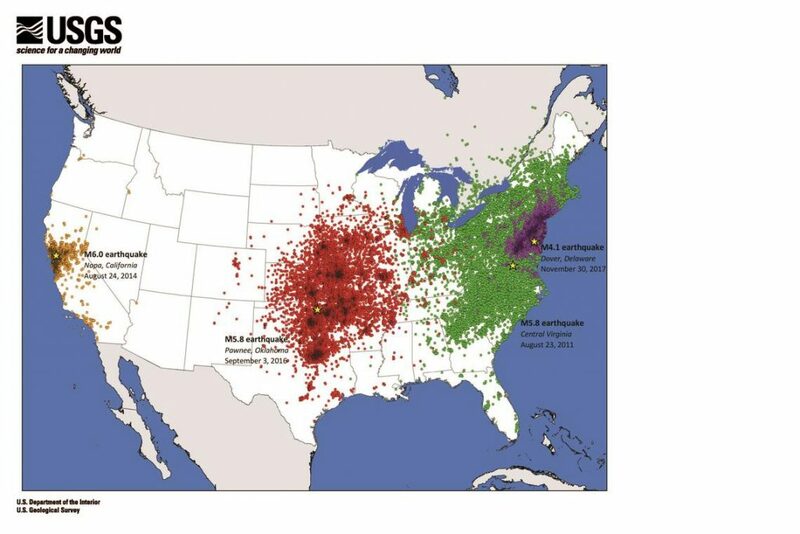 Other major cities in the central and eastern United States with similar geology that could lead to amplified ground shaking include Trenton, New Jersey; Wilmington, Delaware; Baltimore, Maryland; Richmond, Virginia; and Columbia, South Carolina. Similar deposits also underlie cities in the Mississippi Valley and Gulf Coast, notably Memphis, Tennessee, near the New Madrid Seismic Zone. Conversely, the West has more active faults and many areas with sparse vegetation, meaning earthquakes can leave clear markings that inform research on earthquake history, size and effects. 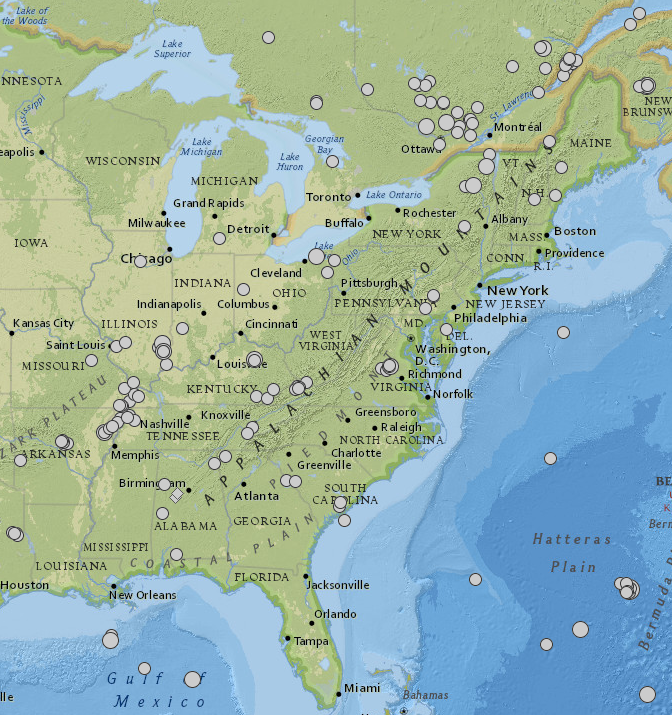 The National Science Foundation and the USGS recently added new seismic stations in the central and eastern United States, creating a more robust network that augments the monitoring by university partners. USGS scientists also are working with university collaborators on several research projects. For example, they are searching parts of Virginia and the Carolinas for evidence of strong earthquake shaking in the past, monitoring earthquakes and studying faults near the 2011 earthquake in Virginia and the 1886 earthquake in Charleston, South Carolina, and conducting detailed studies of the seismically active central Virginia region. As far as predicting earthquakes, no reliable short-term earthquake prediction method has ever been developed. Nor do scientists expect to develop a method in the foreseeable future. However, using scientific data—such as fault locations and patterns of earthquakes over many years—probabilities can be calculated for future earthquakes, and that information is used in development of building codes. Furthermore, the USGS and its partners are working to develop a prototype Earthquake Early Warning System for the West Coast of the U.S. called ShakeAlert. The system does not predict earthquakes, but once an earthquake happens, it could provide a few seconds to tens of seconds of warning before seismic waves arrive and cause strong shaking. The western United States lies along the boundaries of major tectonic plates that make up the Earth’s crust—the North American Plate and the ocean plates to the west. These plates are moving against each other, breaking up the crust along many faults like the San Andreas Fault. Faults in the East are less active and lie entirely within the North American Plate. But in the East, there is this not well-known, but still dangerous Ramapo fault! And the New Madrid fault is overdue for a Big Quake. So just in case: Get prepared and Be ready! I would imagine it has to do with geologic structure, which would be different from one coast to the other. Professor Michio Kaku said around year 2011 “Do not sell your house yet! The big change will happen in 2018 instead of year 2012.” When I heard it in 2011, I felt “I have to wait until 2018! That will be a long wait.” I hope this year will be the big change year, the year of the New Earth! Recently, I heard “Changes will happen overnight” kind of massages many times. But most of people might not realize the big change happen. They might not realize even they are sent to a different planet or dimension. I have found a nice video I want to share with people come to this site. This young guy is a great teacher, look like Saint Germain (He might be St. Germain disguised as Aaron Doughty.) I am not perfect like him. But I use some of his techniques. I am almost vegan. Yes, sometimes eat sea food such as shrimps, but after I eat some of sea foods and dairy products, I do not feel good, and my energy level is affected. In order to cleanse my body, I drink the cocktail of small amount of baking soda, organic apple cider vinegar (Bragg is the best), and water. I have my policy that I will not get associated with anybody very much. I do not exchange phone number, even some Japanese people asked me in the US. I will never associate religious people because any religion does not serve me at all. Finally, I do not have a TV in my house. When people visit my house, the first thing they usually say is “You don’t have TV.” Yes, TV programs do not serve me and my life. I feel I waste my time whenever I watch. TV is the brainwash to control your mind. I am not interested in being brainwashed and controlled by TV. I do not like consumerism, buy this, and buy that. Just give up everything you do not need, and organize your life. I guarantee you that you life will be simpler and better. Another interesting video explaining what kind of world we are living in. In order to escape this Matrix created by reptilian Illuminati, you really need to use the techniques of Aarons’ video. Channeling – The art of healing your life – Father God – 19 May 2018 – My children, I love you all very much. And now is really the time for all of you to love yourself more. It’s time for you to fall in love with life. To love your life. To move forward in this grand adventure that is your life, in ways that will bring you the greatest joy, passion, fulfillment and unlimited abundance. All of this should soon be flowing to you with perfect ease, calm and peace. The time of struggling ‘to make a living’ or ‘to make ends meet’ is very much OVER! Now is the time for great abundance to flow into all aspects of your life, and all you have to do is open up and allow yourself to be ‘in the flow’.